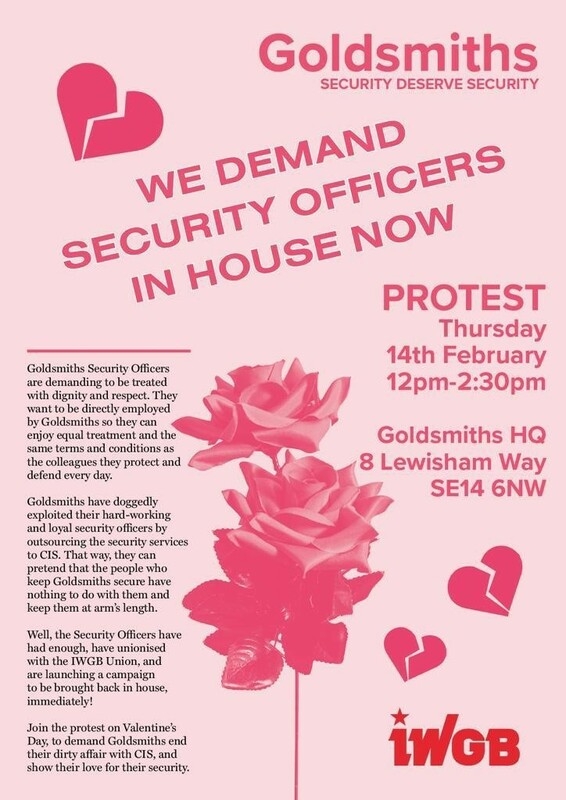 Nearly 100 security officers working at University College London have signed an open letter to the University Council drawing its attention to extremely serious issues relating to Axis, the university’s outsourcing contractor. We are writing as security officers currently employed by Axis on the University College London contract to bring to your attention and that of the wider UCL community the conditions, which those staff who keep your buildings and people safe currently endure. As part of the TUPE process when an employee moves over to a new company they are asked to supply a comprehensive schedule of data. This includes bank details, copy of passport, national insurance number, full name, addresses in the last 5 years and other biographical details. Guards provided this information to Axis (in hard copy), only to be later contacted and asked to supply data that had already been provided. We estimate around 70% of the guards were asked to resupply data, including passports and bank details. We believed that Axis had lost a quantity of the hard copy data we had given them, and this was confirmed in an email by an Axis manager in response to union enquiries. Despite this, Axis have subsequently denied losing the data and claimed that it had just not been sent in the first place by the guards. Not only the loss of this data extremely serious, but the fact that Axis have chosen to blame officers and cover up the truth makes them unfit to hold this contract. The matter has now been referred to the Information Commissioner’s Office (ICO). Despite Axis having had 3 months prior to the 1 November 2018 transfer to shadow the outgoing contractor (CIS), they made the astonishing revelation after the handover that they had not obtained any of the holiday records for the 200 or so officers who had TUPE’d from CIS. Quite simply, this meant that they had no record of the holiday that had already been taken that year, and no way of knowing what their officers were entitled to. When this came to light, rather than take responsibility for the situation, they blamed CIS. We believe that it is one of the basic requirements of an employer to be able to handle holiday issues, and would add that the failure to flag this up prior to handover casts grave doubts on the capability of the UCL facilities team tasked with overseeing the transfer. Paying guards at a rate lower than their usual hourly rate. Holiday pay missing completely from pay. Paying holiday at less than the 12 hours that they work in a shift. Not recognizing the correct number of holidays a guard had remaining for the pay year. Not recognizing when guards had been given permission to carry over holiday from the previous year by the previous security company. Guards unable to book holiday on the company’s holiday system (Timegate). Guards being placed for months on the wrong tax code, in some cases depriving them of thousands of pounds. For December alone, the IWGB union reported more than 30 cases where errors had been made, and there were doubtless many more errors, which were not brought to their attention. That this should occur for one month is shameful. That four months after the contract was taken over by a company that boasted of their record of low payroll issues guards should continue to be underpaid on a regular basis is unacceptable. Indeed, given the frequency of these payroll errors for a predominantly BAME outsourced workforce versus the virtually zero rate of error for mostly white in-house staff, this constitutes indirect discrimination. It should be re-iterated that we (with cleaners and caterers) are the lowest paid staff in the University – one missed or reduced wage packet can lead to direct debits bouncing, mortgage payments failing and overdraft charges being incurred. It is a scandal that this has been allowed to occur with nothing more than a shrug of the shoulders from UCL. Failure to remedy mistakes. Despite the fact that they must have realised that they did not have the correct holiday information for any of their guards (see above) Axis made no effort to contact them. When the IWGB flagged this up, they then promised to send a letter to all staff to elicit the relevant missing information. No such letter was sent – and when challenged on this Axis first lied and claimed it had been, and then when confronted with the truth said they had email ‘some’ of their staff. Lack of response. Axis managers often do not reply to or even acknowledge emails. Staff were constantly being told another manager is dealing with a problem, or that they need to talk to head office, who then passes them back to a site manager. Now they have one manager to deal with problems, but it took too long to appoint and communicate this to the guards. Passing the blame. First of all they blamed CIS, the previous security company, saying that they had not supplied the information they were required to supply, or that it was just inaccurate. They seemed to suggest that the very guards who they were failing to pay properly were LYING about having supplied information to them and about the details of the holiday entitlement. They hinted that individual CIS managers, some of whom themselves were TUPE’d over to Axis, were taking actions designed to sabotage the handover. This is very subjective, but they seemed, at times, to suggest that UCL had not told them everything they should have been told before tendering for the contract. Failure to honour promises. At and IWGB meeting on 9 January with Mark West and Lesley May we asked Mark and Lesley to request Axis send a written apology to each guard’s home address, as a first step in winning back the guard’s confidence in Axis. They promised this would happen. We assume Mark and Lesley relayed our request. A letter was sent, but it did not contain anything we believe could pass as an apology. Finally an email containing an apology was sent – on the 5 February, nearly a month later. Despite the contract having been in place for more than 4 months, many security guards at UCL are still without proper uniforms. Some guards are still wearing CIS uniforms, while others have had to purchase their own garments have been issued with inappropriate items for their gender. This has been flagged up by guards on many occasions but without resolution. The terms and conditions under which security at UCL work are a disgrace to the institution. Security are the lowest paid staff (along with cleaners and caterers) and work extremely long hours. We do not have work related pensions (only have the Statutory Enrolment Pensions). Unlike outsourced security in other Bloomsbury universities, UCL guards receive only the statutory minimum 28 holidays (in-house staff get 41), and just 4 weeks company sick pay (in-house staff get 6 months full and 6 months half-pay). In addition many security guards (working 3 on 3 off etc) are only receiving 22 days holiday, not 28. There are no additional payments for overtime, whether that be at weekends or nights.In addition, staff are forced to stand outside without relief for huge stretches of the day, and breaks are frequently missed or delayed. While Axis have failed to resolve these issues, it is at least fair to say that many of them pre-date them. The issue here lies with the very nature of outsourcing itself, which is a cruel, inhuman and discriminatory way for a supposedly progressive institution like UCL to avoid its responsibilities to its most vital workers. As a consequence, we would contend that although Axis are demonstrably unfit to run this contract, these problems would exist to a greater or lesser extent under any outsourcing company (under CIS payroll problems were rife, as was the rapid turnover of managerial staff which continues to hamper efforts to run a competent service). UCL therefore does not just need to cancel this particular contract (re which, if the above evidence is not enough, the IWGB can provide copious detail on Axis’ failings and incompetence) but to end the process of contracting out entirely, and restore security to their rightful place as UCL employees, with the humane treatment and decent terms and conditions this implies. We are calling on you too make this decision as soon as possible – before UCL’s reputation is permanently tarnished before the wider world and its security staff lose their patience entirely. In December 2018, a group of city investors wrote to listed firms urging them to pay all employees a living wage, which in London is £10.55 and hour. What pity that Nurture, the gardening outsourced company contracted to look after the University of London’s (UoL) grounds at Senate House, doesn’t buy into that “responsible business” sentiment. The living wage is a powerful weapon against poverty. Yet, nearly four months after the London Mayor announced a new London Living Wage of £10.55 per hour (an increase of 35p per hour) some of the staff employed by Nurture are still being paid at the old rate. Hopefully that will change now that the secretary of the UoL branch of the Independent Workers Union of Great Britain (IWGB) has sent the company a gentle reminder (see below). It has been brought to my attention that some staff employed by Nurture on the University of London contract are being paid below the London Living Wage (LLW) rate of £10.55 an hour. As you are aware, Nurture is obliged under the terms of its contract to pay the LLW as a minimum. Can you confirm that this will be corrected with immediate effect, and back-dated to November? Thanks so much to everyone who came to the University of London ‘back in-house’ fundraiser party on 15 September, and to those who helped raise the money in a range of creative ways. These included raffle prizes donations and the organising of a well-run bingo session. Some 200 people descended on SOAS for the event. We had an amazing time and managed to raise more than £2,000 which will help us continue the fight for justice and equality and support the next strike by outsourced workers at Senate House. ¡Muchísimas gracias a todos los que vinieron a la fiesta de recaudación de fondos para la campaña de la rama Universidad de Londres anoche, y tambien a todos quienes nos apoyaron y ayudaron a recaudar el dinero de diferentes maneras! Definitivamente la pasamos genial y logramos recaudar más de £2000 para la próxima huelga y para seguir luchando por justicia y igualdad! Below, is an extract from a letter from Birkbeck Justice for Workers, which provides an update on its campaign to bring Birkbeck, University of London’s cleaning, catering and security staff back in house. They also share a letter in solidarity received from the South Africa’s Outsourcing Must Fall movement. Our campaign is gathering pace. We have over 450 signatures on our petition – we’d love to get that to 500, so please keep sharing with your friends and colleagues. Birkbeck UNISON are having positive negotiations with management and we know the weight of support for our campaign is strengthening our hand. We have also received a heart-warming message of solidarity from the Outsourcing Must Fall movement in South Africa – you can read that below. The message of solidarity mentions fighting unions. We’d like to thank the University of London IWGB for joining us at our demonstration last month. We write to you in solidarity with your struggle for the insourcing of workers at Birkbeck College. Our struggle against outsourcing received national prominence during the student protest against fee increases in 2015 when insourcing of workers was included as part of #FeesMustFall movement’s demands. The solidarity from students raised the profile of our struggle against poor working conditions and wages we had endured since our universities introduced outsourcing of what it called, ‘non-core functions’ in the late 1990s. Although outsourcing is commended as ‘cost effective’, ‘efficient’, ‘productive and strategic’, it has been shown through a cost accounting analysis based on the experience of the University of the Witwatersrand in South Africa, that it results in increased ‘transaction costs’. These include cost creep from an increase in complaints and worker unrest, the loss of coordination efficiencies and of tacit skills and organisational memory (Adler et al., 2000, in Dumba, 2014). The combination of these elements have shown the opposite of organisational efficiencies claimed to justify outsourcing. Notwithstanding the victories scored to be insourced at some of the institutions in South Africa, there is still a long road ahead against outsourcing in our country. Not only are many higher education institutions still using workers from outsourced companies, the #OMF has had to extend its campaign to include the whole of the public sector where cleaning, security, catering and landscaping services have been outsourced at local, provincial and national government level including parastatals. We have combined different tactics of protests such as pickets, occupations and strikes to make our voices heard. We have also approached political parties to pass motions against outsourcing in the Legislature but we have yet to see results from this approach. While we have worked with a union, and many members of #OMF have subsequently joined this union, we have had to fight on two fronts, of the union and #OMF campaign. The latter has proven to be much more flexible to respond to the immediate concerns of workers. We are also of the view that our campaign has the potential to revive and rebuild fighting unions in the process of struggling to ensure outsourcing does fall. We wish you all the success with your struggle against outsourcing at Birkbeck College. I have not yet received a reply from yourself or the University to my emails below, but as a new statement has appeared on the intranet I am going to take that as a response of sorts. There is much in that statement to take issue with (I believe my colleague Dr Moyer-Lee has already been in touch regarding this), but I just wanted to concentrate on one key point. The statement claims: ‘The continued protests reinforce the belief expressed by the Board that bringing services in-house will not eliminate continued disruption and the resulting high costs’. Surely it is obvious that the opposite is true. The protests have continued because services have NOT been brought in-house. All the University has done is issue a vague statement which guarantees nothing. A clear declaration that all services will be brought in house within 12 months, if agreed by the workers (we do like to include the actual people affected in these decisions), would end the campaign and of course eliminate the continued disruption. This is the IWGB position, and it could not be more reasonable or straightforward. I would once again ask you to look at the situation objectively – these workers are simply asking for equal treatment. The University is denying them this, and refusing to talk to them or their representatives. Therefore they have no option but to campaign. The costs that this is incurring for our institution are totally unnecessary, and result from the University’s unreasonableness. I, and your outsourced workers, would appreciate at least the courtesy of a reply to this email. I am also attaching today’s letter from John McDonnell, in which he calls for a new statement from the University of London containing ‘no longer than a 12-month implementation period’ and ‘dialogue and negotiations with the IWGB’. I hope that the University will take note of the opinion of such a senior figure, and take these two sensible steps to resolve this issue. I am just following up on my emails below, to both yourself and the Board of Trustees, having received a reply to neither. I am doing so in the light of tomorrow’s industrial action and protest, and also the revelations in yesterday’s Guardian newspaper as to the sheer scale of the University of London’s spending on additional security. IWGB members (particularly those Cordant workers who have been on strike for the last year) are extremely frustrated and disappointed, having been given no solid guarantees at all as to their future, and left hanging with appalling management and discriminated against in terms of their terms and conditions. We have continually offered the University the opportunity to negotiate directly with its outsourced workers – and the University has refused to do so, and instead spent hundreds of thousands of pounds unnecessarily. The University now has the opportunity to resolve this crisis (see below for the workers’ extremely reasonable demands – that contracts be brought back in-house within 12 months). Should it not take it, then it must take responsibility for all the additional costs, damage to reputation (the Observer will be reporting tomorrow from the picket line) and disruption to its core academic mission. I hope that you and the Board of Trustees realise that it is simply irrational to continue with this policy. I am writing as branch secretary of the University of London IWGB with regard to the campaign to bring workers in-house at the University of London. I would like to start by apologising for not writing to the whole Board. As you probably know, it’s hard to track down contact details for all the members – please do forward this on as appropriate! As I am sure you are aware, the IWGB represents the vast majority of outsourced workers at the University of London, and has been campaigning since September 2017 to end outsourcing and the discriminatory 2-tier workforce at Senate House. The campaign has garnered huge press attention and popular support, most recently featured the biggest outsourced worker strike in HE history, and has resulted in the decision of the Board of Trustees (made at the 23 May meeting) to bring workers back in-house. 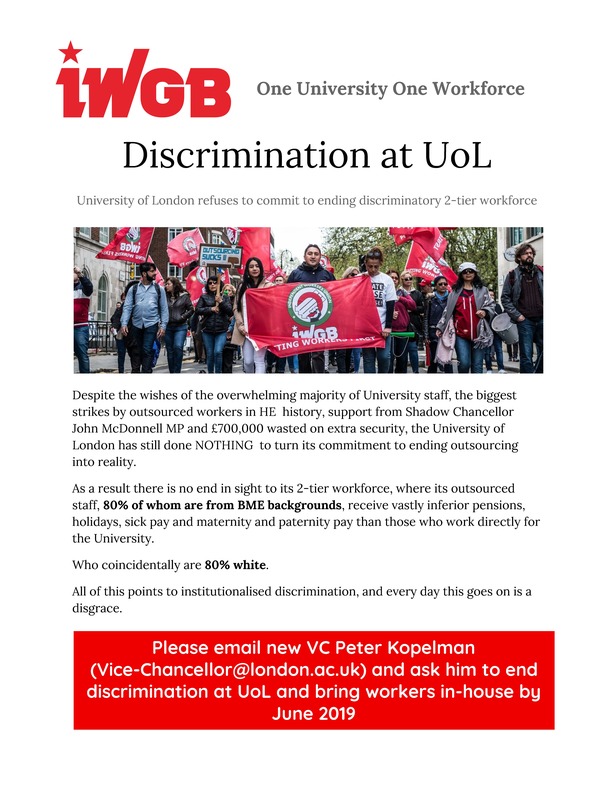 However, as you will see from my email below, while we welcome this decision in principle, the statement issued by Adrian Smith is extremely vague, and as a consequence has no chance of achieving the stated aims of the Board in reducing the risk of industrial action or ending disruption at the University of London. Indeed, there is another strike planned for next Wednesday 6 June, which has already caused a major event to be moved. What we are calling for is very straightforward – a clear statement from the University of London (similar to that made by SOAS) that outsourcing will end in 12 months or less. Without clarity on this issue, there is no way that our members and supporters (who know that it is only their pressure that has brought the University to this decision) will end their campaign. We will be making this letter public, so that it is quite clear how reasonable the IWGB position is – and that the ball is clearly in the University of London’s court if it wishes to end this dispute. I am writing in response to the message below from the Vice-Chancellor regarding the Board of Trustee’s decision on bringing outsourced workers in-house. While we welcome the decision in principle expressed below, this statement will not be sufficient to end the in-house campaign at the University of London, or stop the strike action due to take place next week. The disruption to the University’s activity will continue (I am sure that you will be aware that next week’s Down and Out event has chosen to move location in support of the workers) and the University will continue to accrue negative publicity (see today’s letter from Green Party co-leader Jonathan Bartley (attached) as well as numerous press articles (of which this is the latest). The situation is only likely to escalate given the extreme disappointment among workers which the VC’s statement has engendered. I am therefore writing to clarify what is needed ‘to expedite the process to reduce the risk of industrial action as far as possible and ensure the University is not distracted or hindered from furthering its core academic mission’ – something which both we and the Board wish to see. The current statement is much too vague with regard to contracts, timescales and even which groups will be affected. Workers require a statement along the lines of the 4 August 2017 SOAS announcement from Baroness Amos, which made clear that outsourcing would be ended within 12 months, and all workers brought in-house house with no loss of jobs or hours. The IWGB and its members would then be prepared to suspend the campaign, and we could move onto working together to ensure that the transition was a smooth one and beneficial to both parties. Our position is an eminently reasonable one, and I would remind you that we remain (as I have reiterated on numerous occasions) open to direct talks to resolve this dispute. The University will develop an efficient provision model in which in house services are supported by contracts designed to provide both the specialist expertise and the flexibility to respond to the varying needs of the University. However the Board raised significant concerns over the additional costs of bringing services in house and the impact on the University’s academic agenda. The Board were content to support the Review Group’s recommendations contingent on seeing more detailed plans and costs which would deliver benefits to both staff and the University together with plans for mitigating the impact on academic activities and student facing services. The Board would like the University Management to expedite the process to reduce the risk of further industrial actions as far as possible and ensure the University is not distracted or hindered from furthering its core academic mission. In practical terms, these initiatives will be progressed over the next 12-18 months with some services being brought in house in 2018/19 where there is an opportunity and clear rationale for doing this although the process will be phased over subsequent years. I would like to thank the Review Group on the thoroughness of the review and the understanding reached on an extremely complex set of issues. While the outcome may not meet everyone’s expectations, I do believe it to be reasonable, measured and deliverable. Based in the Board’s decision, I have asked for additional security to be stepped down in the hope that the threat of student occupation is now reduced. This will be kept under review and will be reintroduced if necessary despite the high costs. Starting at once, the University Management will work closely with the recognised Trade Unions, (UNISON and UCU) and current contractors to transition staff into the University as well as work urgently to address issues that have been highlighted during the review e.g. the elimination of zero hours contracts.